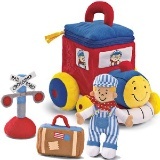 Looking for train party favors, toys and gift items? You have got it! Add excitement and fun to your train theme birthday party with the following party favors, toys and gifts. The following goody bag (treat sacks) favors can be used to hold train birthday party with a creative flare. Your little guests will remember your train party for months afterward.